We have become a nation of gadget freaks; the whole population is in love with smartphones, fitness trackers and super stylish watches. Whilst these gadgets have become commonplace, there is a new wave of tech that is making its way into our homes, and making our futuristic domestic dreams come true. Check out our top five gadgets that you need to make space for in your life. This showerhead speaker is an unbelievably cool way to listen to music whilst you’re having a wash. It syncs with Bluetooth-enabled devices including smartphones, tablets and laptops that are located up to 32 metres away, which means that the days of risking getting your gadgets wet by bringing them into the bathroom are long gone. It’s super easy to install as the speaker easily snaps into the shower head using a magnet, plus you can use it in other rooms too. 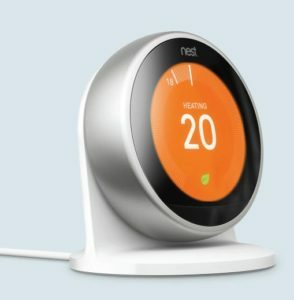 The Nest Learning Thermostat is a nifty little device that does exactly what it says on the tin and learns all about your heating habits. It helps you to save money by adjusting your home heating when you’re not even there, so it can make sure the house is nice and toasty for when you get back from work and keep the temperature under control when you’re on holiday. It’s compatible with many heating systems and you can also control your hot water with it too! Chromecast allows you to stream the films and shows you love from your devices to your TV. It’s a small, and super cheap, dongle that plugs into the back of your television and lets you cast from your smartphone, laptop or tablet whilst using your device to change programme and control the volume. It’s perfect for use with popular entertainment apps such as Netflix, YouTube, Google Play and BBC iPlayer. iKettle is the world’s first wifi kettle, which allows you to boil your kettle with your phone from anywhere in your home; perfect for when you’re waiting for the ad breaks on telly to make a cuppa. You can also set an alarm so that the kettle is boiled just as you get up or return from work and, if you’re picky about aesthetics, you can match the kettle to the look and feel of your kitchen with different kettle skins. If you aren’t the greenest fingered of people and your plants keep dying on you, this gadget is exactly what you need. Stick it in a pot or in the ground next to your plant and monitor sunlight, temperature, moisture, fertilisation to make sure your plant stays healthy. You can also download the Flower Power app which sends alerts to your smartphone and lets you know exactly what your plant needs, meaning it will stay beautiful and healthy. Fancy getting your hands on these gadgets? Take part in paid market research and earn some extra pennies to put towards purchasing these gadgets yourself! 5 top tips for upcycling! Every item that you come across can be viewed as an upcycling opportunity. Something might seem ugly at first glance but the trick is to look past the imperfections and find the potential. A good place to start is to look around your house for bits of furniture that have become worn or broken and figure out how you can transform them. Or go online! Check out local buy and sell Facebook pages in your area to find hidden gems. If you need a bit of inspiration, Pinterest is full of wonderfully creative ideas. If you feel a bit daunted about taking on a project, the best idea is to start small. Technical aspects of upcycling, such as woodwork, can seem overwhelming at first, so why not start with something easy and work your way up? Try some simple painting and then move on to more complicated projects like sanding, staining and waxing as you grow in confidence. Painting is a great place to start because if you mess it up, you can just paint it a different colour! If you bite off more than you can chew with your first project you might be tempted to jack the whole thing in, so go steady at the beginning. You might be lusting after a beautifully upcycled French dresser like the one you saw on Pinterest, but if you haven’t got the skills you’ll end up frustrated. Choose something simple, like a chair that needs reupholstering and painting, and don’t rush. Whilst we highly recommend using the internet for inspiration, you’ll get so much more out of upcycling if you develop and hone your own style. The amazing thing about upcycling is that you end up with totally one-off pieces and this will be extra special if you’ve done it all in your own unique way. Embrace the fact that you’re a one off and your upcycling projects will reflect this; you don’t need to be comparing yourself to other people or projects that you see online. Part of the joy of upcycling is that you can make mistakes and it doesn’t matter; just incorporate them into your designs or simply start all over again. Experimentation is an enjoyable part of the process and can lead to your best work, as well as helping you to define your own particular style. 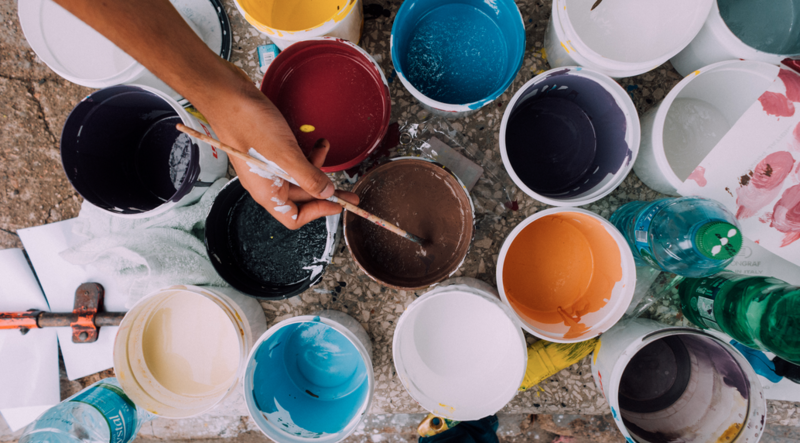 If you don’t get it right the first time, don’t worry, as taking risks and embracing your mistakes will help you to learn and develop the skills you need to be an incredible upcycler. Looking to start your upcycling journey? Here’s how to make some extra money to fund your projects!